Self Portrait, 1969 Oil on Canvas 50 1/2 x 50 1/2 in. Images courtesy of the artist and Kent Gallery. 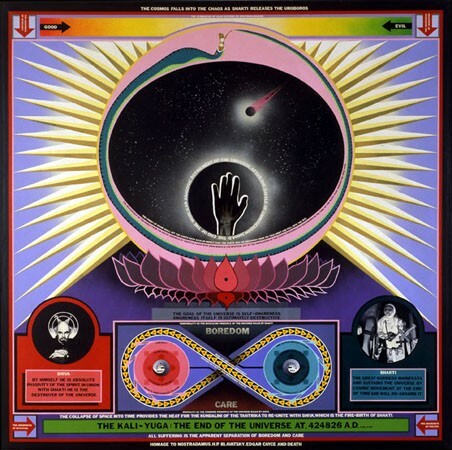 The Kali-Yuga: The End of the Universe at 424826 A.D. (The Cosmos Falls into the Chaos as the Shakti Oroboros Leads to the Elimination of all Value Systems by Spectrum Analysis), 1965 Oil, acrylic, vinyl lettering, and x-ray on canvas 73 3/4 x 73 3/8 in. Homage to the Black Star of Perfection, 1965 Oil, acrylic, and vinyl lettering on canvas 51 1/2 x 51 1/2 in. Homage to Ouspensky, 1965 Oil, acrylic, and vinyl lettering on canvas 37 1/2 x 37 5/8 in. 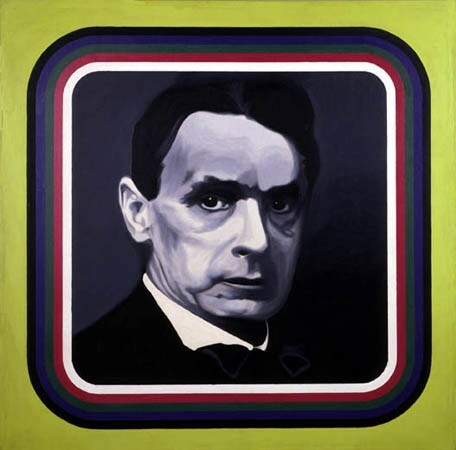 Portrait of Rudolf Steiner, 1965 Oil and acrylic on Canvas 51 1/2 x 51 1/2 in. 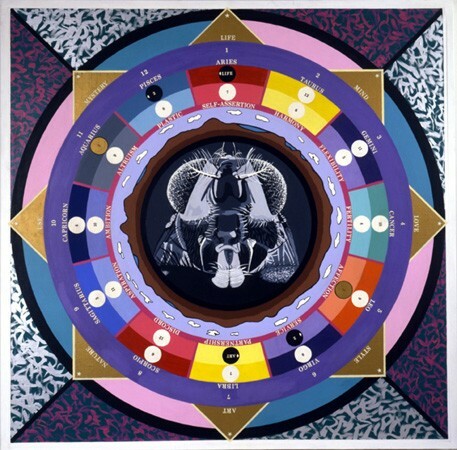 The Zodiac Wheel, 1965 Oil, acrylic, and vinyl lettering on canvas 49 5/8 x 49 3/4 in. 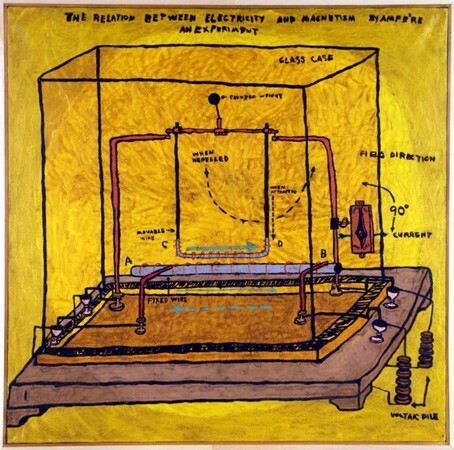 The Relation Between Electricity and Magnetism by an Experiment, 1967 Oil and acrylic on canvas 37 1/2 x 37 3/4 in. 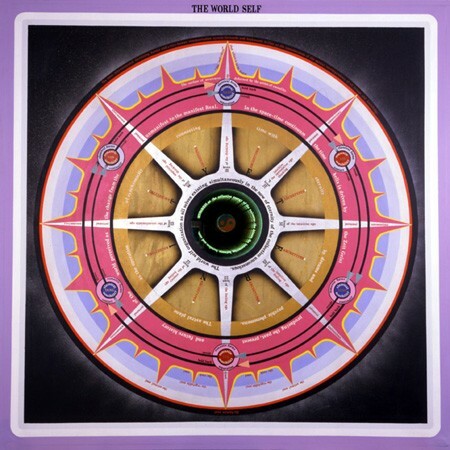 The World Self, 1967 Oil and acrylic on canvas and vinyl letters with a magic mirror 61 1/2 x 61 3/8 in. Alice Pleasance Liddell, 1968 Oil, Acrylic, Ink on Canvas 73 1/2 x 53 1/2 in. The Urban Fossickated Octave, 1968 Oil, acrylic, ink, vinyl lettering on canvas 49 5/8 x 49 1/4 in. Let Project 70 Come to You, 1969 Oil, acrylic, and vinyl lettering on canvas 36 1/2 x 36 1/2 in. Paul in 2007. Giuliano photos. 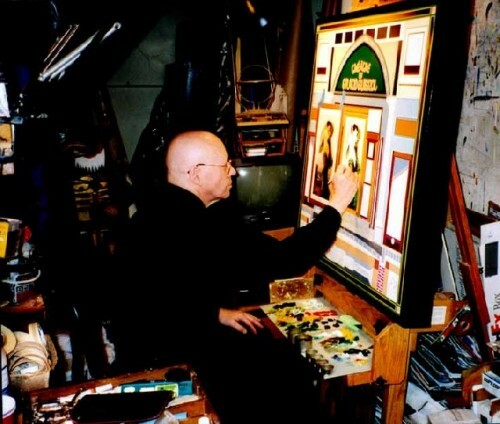 The artist at work in the old studio. The Lion King of Visionary Art. 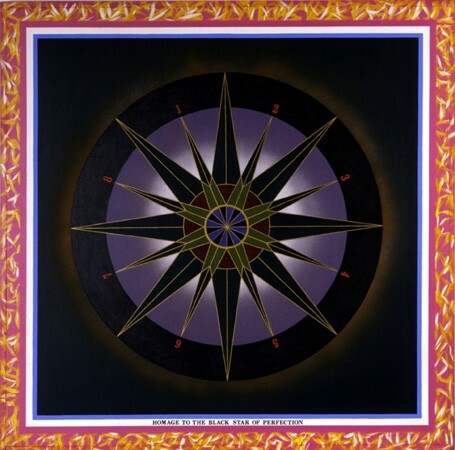 In every sense, in the field of Visionary Art, Paul Laffoley is a cult figure. As I found out when I curated a solo exhibition "Paul Laffoley: The Gaudi, New York Hotel for Ground Zero" October 7 through November 10, 2004 for the New England School of Art & Design at Suffolk University. During the process of organizing the project, which entailed visiting his densely packed small studio on Bromfield Street, the home and office of the Boston Visionary Cell, I was astonished to learn that it would be his first Boston exhibition in some 20 years. Or, since the Stux Gallery vacated Newbury Street and relocated to New York. As a part of the project we worked with Joanna Soltan the director of the gallery program for the School of the Museum of Fine Arts to sponsor a lecture on October 7. For the most part I was chagrined by the apathy of my colleagues, the indifference of the Boston art world, and that we were snubbed by the media. So Joanna and I were astonished by the large and enthusiastic turnout for Paul's slide show that lasted for a couple of hours, followed by another hour of questions. Most of the audience represented loyal followers of the work who had literally flown in for the occasion. There was a group of students from Portland, Maine who had taken the bus to hear the rare lecture. The artist, as always, was in great spirits. He even wore his specially designed lion's foot prosthesis. Like Joseph Beuys it would not be a surprise for him to lecture for several hours to a dead rabbit. For Laffoley there is no audience too large or too small. To say that he is brilliant, unique, and misunderstood is an understatement. On the few occasions when he functioned or worked in the academic world or his chosen field of architecture there were lapses. His thesis at Brown was delivered years later in the form of a painting which was actually shown during the NESAD exhibition. Basically he was expelled from the graduate program of the School of Design at Harvard University. After that he relocated to New York to work for the visionary Frederick Kiesler who fired him. Then he worked for 18 months on the design of floors 15 to 45 of the World Trade Center under the director of the architect Minoru Yamasaki. At one point he suggested to his superiors that bridges be constructed to connect the towers for security and stability. He was fired on the spot. In hindsight he was all too correct. Laffoley continued to be fascinated with the site of what tragically became Ground Zero. It appears that Antoni Gaudi, the visionary architect, who worked exclusively in Barcelona, created a design, never executed, for a hotel on the eventual site of the World Trade Center. 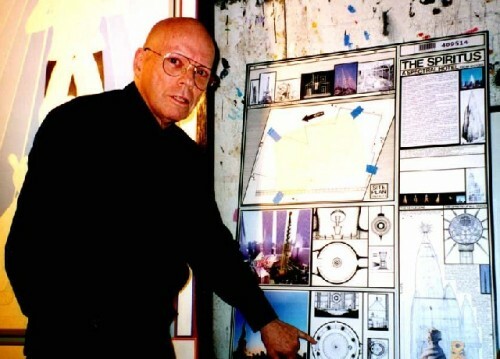 During a call for proposals for a 9/11 Memorial Laffoley submitted a project based on the Gaudi design which was the theme of the NESAD exhibition. It was gratifying that our exhibition was acknowledged in the annual awards of the New England Chapter of AICA, the International Society of Art Critics. Approximately a year later the then new Boston Globe art critic, Ken Johnson, wrote a Sunday feature that fully recognized his status in the Boston and International art world. After a relatively short tenure at the Globe, Johnson returned to the New York Times. Ken Johnson's Globe article. The current exhibition at Kent Gallery, which has long championed the artist, is focused on ten large paintings from the 1960s. They were discovered in disrepair when the artist was evicted, in 2005, from the studio he had worked and illegally lived in for 38 years. During my visit there was no evidence of a bed. Paul explained that it was pulled out "after hours." In the harrowing process of moving the paintings were discovered stashed away but not covered. They have been carefully cleaned and restored for the current exhibition. After all these years, as Doug Walla, the director of Kent Gallery explained to me, they are being treated like long lost treasures . The ten paintings are being exhibited for the first time since they were created. He commented that for the most part Laffoley was "discovered" in the 1990s so those who follow the work are unfamiliar with the early years. For me they are a welcome rediscovery. They date from when I first came to know and appreciate the artist. At the time I was doing double duty as an art and rock 'n' roll critic for Boston After Dark which later morphed into the Boston Phoenix. There was a night club at the time, perhaps the better term was Discotheque, on Landsdowne Street just behind Fenway Park. As one entered "The Ark" there was a small gallery which became the permanent home for an installation of works by Laffoley. It was negotiated by Paul's agent, a slippery character, who was notable for always carrying a brief case. Later the club became reconfigured as "The Boston Tea Party" under Ray Riepen and Don Law. It has gone through several evolutions since then. When the Ark folded Paul lost that high profile exposure and retrenched to Bromfield Street and its cooperative gallery. Later there was an enormous show at the Addison Gallery of American Art under its former director Chris Cook. 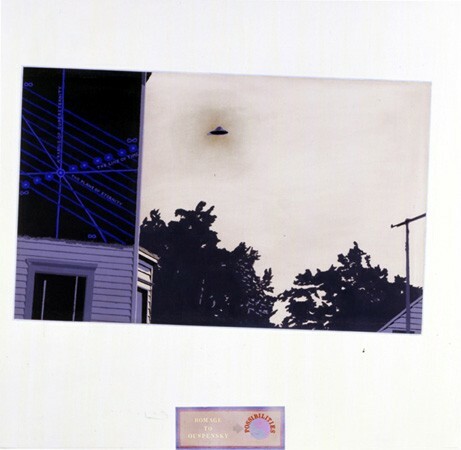 When the DeCordova Museum in Lincoln mounted a survey and catalogue "Painting in Boston, 1950-2000" there was a terrible oversight when Rachel Lafo and Nick Capasso included Alex Grey (a Stux artist who relocated to New York) but excluded Laffoley. It was just one of many gaffs and oversights by the DeCordova's curators. 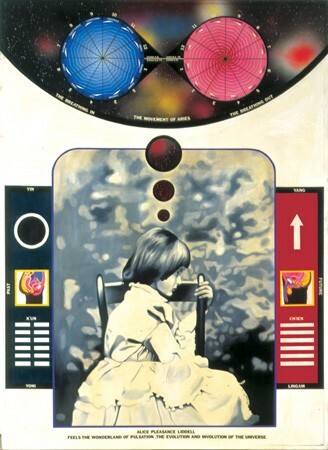 During 1965 Laffoley was working on "The Cosoms Falls in the Chaos as Shakti Urborosi: The Elimination of Value Systems by Spectrum Analysis." 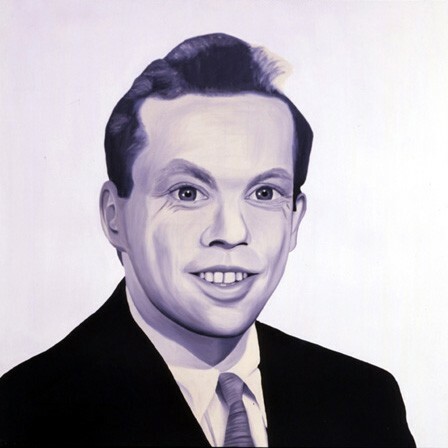 As his work progressed it developed into three sub groupings: "Operating Systems" "Psychotronic Devices" and "Lucid Dreams." The works of that time were often somewhat primitive in execution. He had been trained as an architect but not as a painter. His skills at rendering and graphic design would evolve over the next decades. The works often entailed complex schemes, illustrations, and a copious use of hand applied lettering (Letraset) and text. One has to literally "read" and not just contemplate his work. There is much information to absorb and in that sense the "illustrations" and renderings are clues to deciphering the content and philosophy. Over time the paintings have become more crisp and visual while the agenda has deepened. The Kent Gallery is in the midst of compiling a catalogue raisonne. In 1967 I organized an exhibition "The Visionaries" for the East Hampton Gallery in New York. The project was the basis for the Masters and Houston book for Grove Press "Psychedelic Art." At the time I argued in vain for the term Visionary Art which implied an art of the spirit independent of hallucinogenic drugs like LSD. Had I known of Laffoley's work I would surely have included it. Significantly, to the best of my knowledge, Paul has never taken drugs. 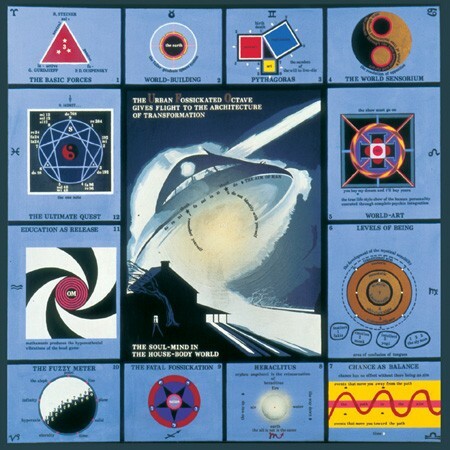 Unlike the work of Alex Grey, who I also knew and wrote about, there is no psychedelic element in Laffoley's paintings. It was an important point utterly lost on the team of DeCordova curators. Sadly, the important work of Laffoley continues to be ignored by the Boston art world in which he resides. It is ironic that he is being celebrated in New York. 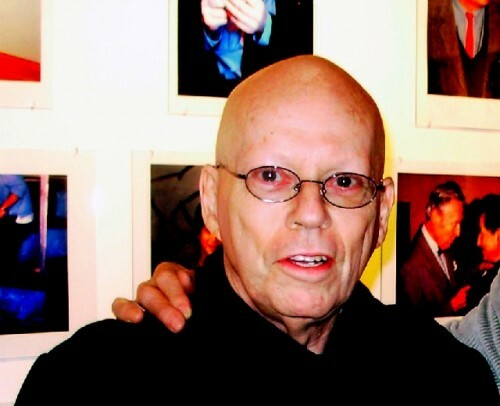 Kent Gallery is to be applauded for representing one of the most significant and original artists of our time.